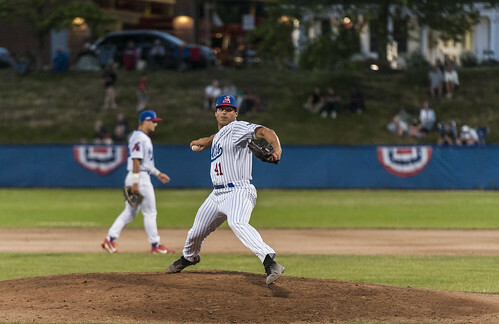 The Chatham Anglers (15-14-2) have visited nine of the 10 CCBL ballparks this season. After Wednesday, they will have played at all 10. Chatham will battle the Hyannis Harbor Hawks (18-10-2) at McKeon Park in Hyannis for the first time this season on Wednesday. John McMillon (Texas Tech) will make his first start of the season against the Harbor Hawks on Wednesday. In his last appearance on the mound against the Harwich Mariners, McMillon struggled with his command at first but quickly turned it around. John McMillon will make his first start of the season Wednesday. Sporting a fastball that was sitting at 94 mph and a breaking ball ranging from 81-84 mph, McMillon allowed one run as the first four batters he faced reached base. But, facing no outs and the bases loaded, the right-hander struck out three-straight batters to end the inning. He only allowed one more baserunner in his next two innings of work as he picked up the save. McMillon, a two-way player, entered Tuesday’s contest as a pinch-hitter in the eighth inning and then played the ninth at first base. It was the sixth time he had pinch-hit in a game, but the first time he played the field. The Harbor Hawks are currently in first place in the Western Division despite a run differential that is for third-worst in the league. Matthew Barefoot (Campbell) — currently second on the Cape in hitting with a .396 batting average — leads the Hyannis attack. Barefoot has 36 hits on the season, 18 runs scored, 18 RBIs and five stole bases. He tops the team in all four categories. Barefoot is not the only Harbor Hawks hitter who has been successful at the plate. Todd Lott (Louisiana-Lafayette) has a .307 batting average, .892 OPS, and five home runs while Will Holland (Auburn) is hitting .423 over the last seven days.